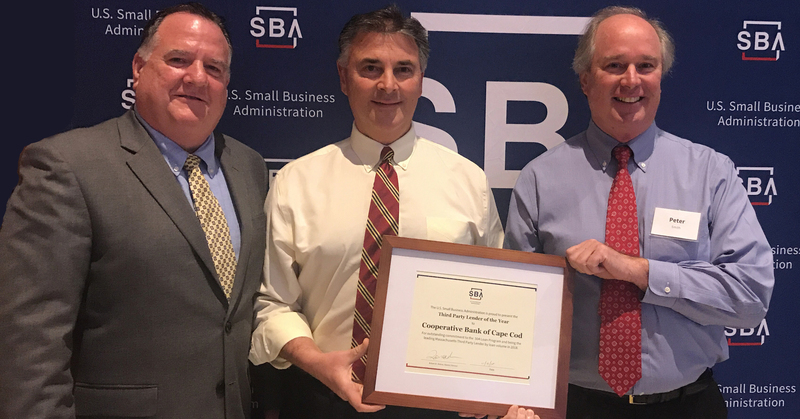 The Cooperative Bank of Cape Cod was recently recognized by the Small Business Association of Massachusetts as the 2018 SBA Third Party Lender of the Year. SBA District Director Robert H. Nelson with Charlie DeSimone and Peter Smith of The Cooperative Bank of Cape Cod displaying their SBA Third Party Lender of the Year awardThe award honored The Coop for its approval of nine 504 projects totaling over $13.7 million dollars, the largest amount for a single financial institution in the Commonwealth. The SBA 504 Loan is designed to provide financing for the purchase of fixed assets, which usually means real estate, buildings and machinery, at below market rates. In Massachusetts in FY18, the 504 Loan Program approved 270 loans, supporting more than $171 million. The award was presented to the bank at the 2018 SBA Massachusetts Annual Meeting which was celebrated earlier this month at Worcester State University. The annual event recognizes the SBA lender network that supports job creation and economic growth in our local communities. The U.S. Small Business Administration makes the American dream of business ownership a reality. As the only go-to resource and voice for small businesses backed by the strength of the federal government, the SBA empowers entrepreneurs and small business owners with the resources and support they need to start and grow their businesses. It delivers services to people through an extensive network of SBA field offices and partnerships with public and private organizations. To learn more, visit sba.gov.